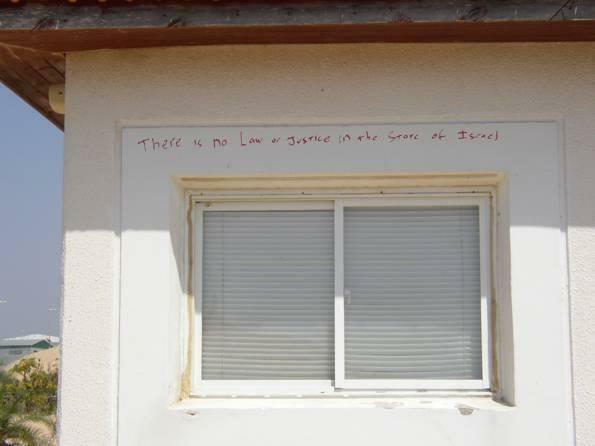 "There is no Law or Justice in the State of Israel"
The more and more I look at our situation, the easier it is to pinpoint our failures. As I mentioned in the previous blog, we spent hours talking to IDF soldiers. Soldiers building their careers, boys entering officers school, command school, pilots courses. Explicit threats to destroy their careers, dreams and goals if they disobeyed, and they wanted to do nothing more than openly disobey. So many of them cried to us. So many of them told us they didn’t understand before what they were doing, and they would never do it again if ordered. I’ve mentioned in previous posts that we must now look at this government as the Goyeshe entity it acts like. The settlements need a program like birthright. 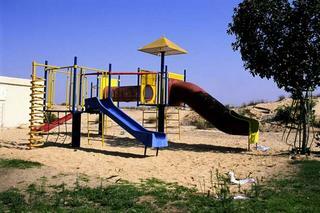 Free trips for every Israeli to see what the settlements really look like. Most soldiers told us they had never been in Gush Katif before (the truth is, most Israelis have never been in Gush Katif). Why would they protect something they have never seen and only heard negative propaganda about? We need to go Face-to-Face with soldiers and youth in this country. Soldiers were at a loss. Those that hadn’t gone through the month long IDF Desensitization Training (brainwashing) were now unable to comprehend and react to destruction they had assisted with. Long term programs need to be created so that soldiers see and feel what they are protecting. They must be taught Jewish history and values. Government brainwashing must be erased with facts. The soldiers we met were searching for meaning, not empty slogans and lies. The Palestinian flags hanging 5oo meters away, and the repeated fall of Palestinian mortars on our position quickly debunked Sharon’s lie of “No Expulsion under Fire”, and ruined the government and IDF’s credibility in their eyes. Where there is emptiness, it must be filled. This must be done 1-on-1 with every soldier in this country. Sharon plans to destroy 60 more communities before the end of the year (you heard it here first). We may not have time to protect those communities, but we must get ready now so we don’t lose Hebron, Ariel, Maaleh Adumim, and even the Temple Mount. I will be uploading a series of posts and pictures describing some of the events of the last few days and the lessons we need to learn from them. Contrary to what one hears on the media and government advertisements, there isn’t a solution for every settler – not even close. The question is whether that is from negligence or from spite. I think the events I will soon describe will answer that question without a doubt. The lies the public are being told are incredible, and the public eats them up. At least Bassi got his NIS 150,000 bonus yesterday for a job “well done”. This story began with a family that understandably refused to leave their home of 16 years for some arbitrary political decision. 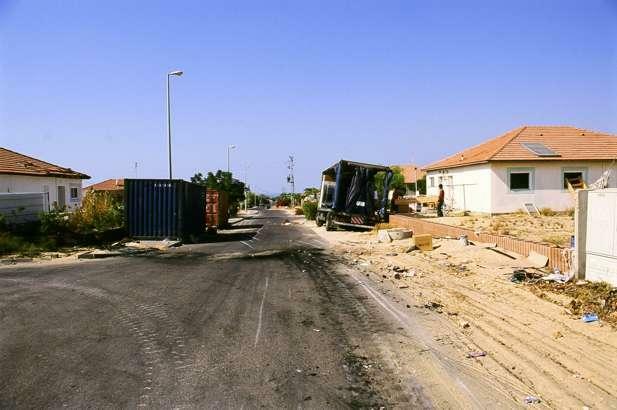 Like most residents of Neve Dekalim they chose to stay and non-violently protest the decision to violently and brutally rip them from their homes – and as a result the government has decided to punish them. First Z. and her family were stuck in some hole in Natzrat Elite. They also immediately lost 30% of their sub-minimal “compensation package”. On Tuesday at 4AM, Z. received a phone call from the IDF, one member of her family will be allowed in to pack their belongings. Upon arrival, Z.’s husband C. was given 30 boxes, and told he has 2 hours to pack up his house. 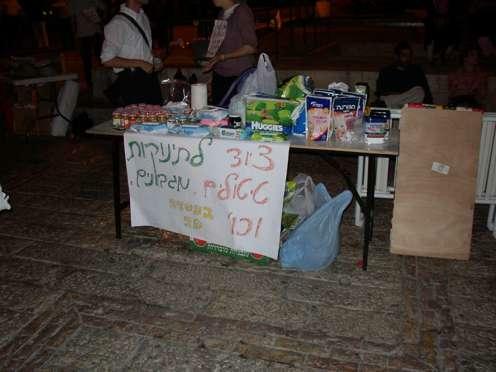 He has to pay NIS 10,000 (~@2200) to move and an additional NIS 1500 for each additional 10 boxes. The packing, the moving, the boxes, and even his bus ride from Natzrat Elite will all comes out of his “compensation package”. He was also told that despite 40 soldiers being available to rip him, his wife, and 6 little children from their home, none will be available to help him pack. 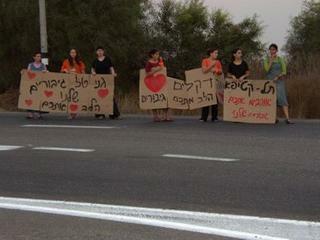 We began an emergency campaign to get assistance for C.
We spoke with numerous Knesset members to no avail. 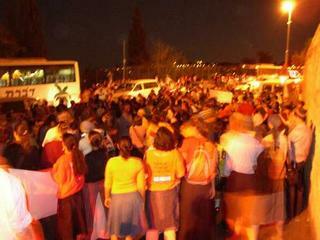 One MK said straight out, “This is an attempt to break the spirit of the religious community”. Finally, we reached a senior member of the Ministry of Defense and C. was allowed to stay on to continue to pack. Some “Mistaninim” (illegal infiltrators) heard C. needed help and clandestinely arrived later in the evening and helped him pack as much as they could. After continued phone call, we managed to get special Entry Permits for Z. and a few assistants to enter Thursday morning. I won’t discuss the tone of the conversation or the threats. We were nearly the only people in Israel given this permission. After more dire warnings and threats, on Thursday morning we set out with valid Entry Permits in an MoD convoy, our cars already having been searched for any political “contraband” (anything in the color orange!). Arriving at Kissufim junction, a vile policeman, seeing religious Jews, pulled our cars out of the convoy and nearly started to beat one of our team members. 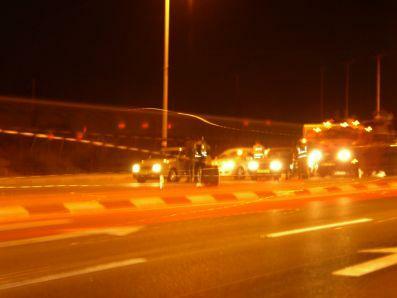 Only the quick attention and appearance of the IDF officer leading the convoy prevented bloodshed. The hatred ingrained in the police towards our yarmulkes was tangible. 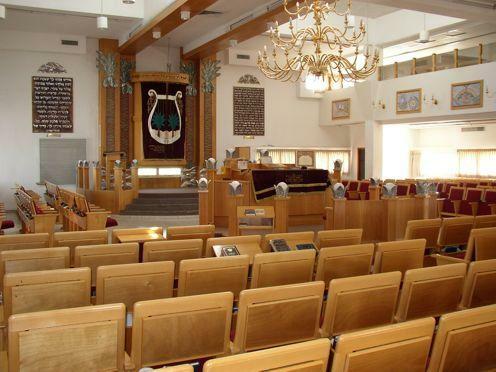 We arrived in Neve Dekalim to find the moving company C&Z were forced to hire (the government only authorized 2 companies) had now upped the price to NIS 15,000 (~$3300). Having no choice C&Z agreed. We began to pack, taking apart closets and shelves, doing as much as we could ourselves, as the moving company tacked on fees to everything else beyond shipping. I can’t even describe how difficult this was emotionally. During our breaks we visited the local Synagogues and Yeshivas slated for destruction and prayed in some of them. At one point I entered an interview being given by a general. When he made the statement that soldiers were helping people pack, I asked him if he’d like to meet a family that has no soldiers helping them. Speaking afterwards to his aide, the Colonel told me that it is not their responsibility. Packing was the MoD’s job. Funny, the MoD said the exact opposite. Somehow the Palestinians forgot to listen to Sharon. 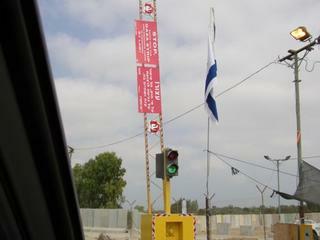 Outside the town we saw Hamas and Palestinian flags waving. 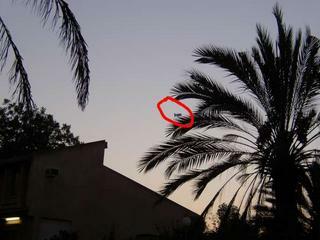 Three Kassam mortars fell into Gush Katif yesterday evening, one not far from us. So much for no expulsion under fire. As I looked at the road around C&Z's house. They explained that the holes in the asphalt weren't potholes, that was where Kassam mortars had hit! Seeing some junior officers and soldiers roaming around, we asked if they could help us pack. They said they weren’t allowed to help while on duty. Soon off-duty soldiers began to arrive at our house and others, and began to help people pack. While the IDF forbade them to help us, these soldiers instead took from their personal sleep and relaxation time to help us. By 8PM we had finished with the stuff going into the moving van. The mover’s fee had now reached around NIS 19,000 (~$4200). We spent the evening talking with the soldiers, and that will be the subject of another blog. At around 10PM, we packed up our cars with items that C&Z would need in the immediate future. 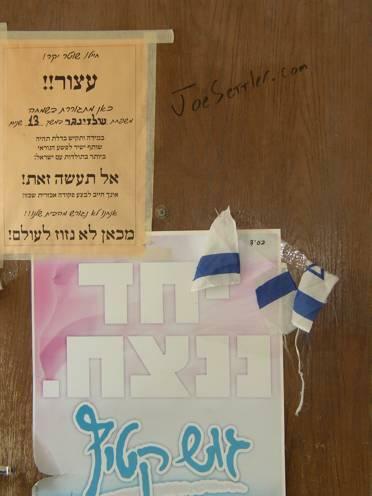 We took the Mezuzot off the doorposts, and ripped Kriah, a Jewish ritual where one rips one shirt - done when a close relative dies or a Jewish community is destroyed. 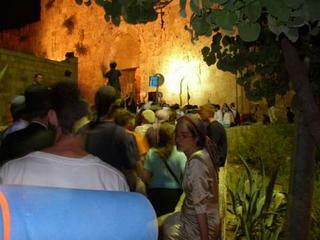 On our way out we stopped at Shirat HaYam and convinced the soldiers to let us in. We walked on the beach and picked up Moshe Feiglin’s protest tent that he had left behind. We drove home hoping for a better future for the Jewish People. Yesterday (as part of a larger story), a typically cynical Secular-Leftist in an undisguised attempt to cause pain wished a friend a “Chag Sameach”, a Happy Holiday. One’s first thought is obviously how evil the Secular-Left are. At the time of redemption, with the return of Jewish leadership to the Land of Israel, all our days of mourning will turn to days of joy. The Left are fools, and in this case I would say nivuah has been left in their hands. Some truly horrendous stories today, but I can't post them for another day or two. Hopefully we will be able to provide/find some sort of partial solution, then I will be able to publicize them. 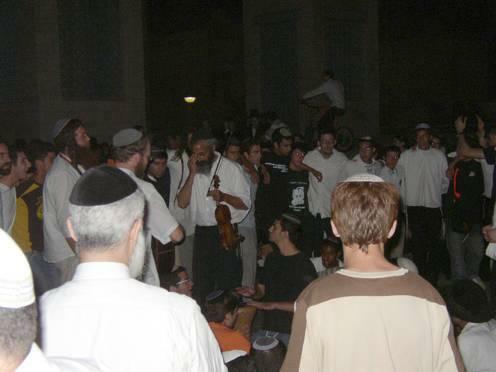 This evening Kikar Safra in Jerusalem was full of hundreds of the homeless, deported Children of Gush Katif and fellow young supporters (often called - Na'ar HaGivaot - The Hilltop Youth) . Here are some photos from 1:30 AM. Wouldn't you like your children to turn out this way? There are few places in this world besides Israel, where one can see so many contrasting worlds within a short walking distance from one another. This evening I had the opportunity to observe the children of Gush Katif (who have just been brutally ripped from their homes) and the children of Israel’s secular elite (who promoted the ripping of these people from their homes). simply supporting each other to keep their wonderful spirits high. It is no surprise to discover that nearly every member of Nezer Hazani served in an elite combat unit, while in contrast, secular hero Aviv Gefen (the draft dodger) and his friends literally dance on a flag of Israel. If I were a secular Israeli, I too would be terrified of the tremendous uplifting, positive spirit of the Na'ar HaGivaot and want nothing more than to destroy their communities. Add in the comment: "attn: Eve Harrow" so she can direct it to where it will help the most. Entering Zion Gate with Shofars blowing. Tables are set up throughout the Jewsh Quarter for any immediate supplies the Heroes might need, such as diapers, baby food, drinks, toothbrushes, etc. 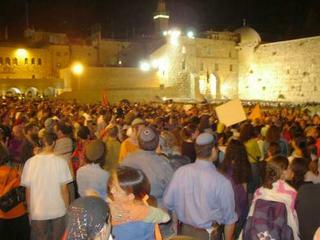 Beginning to trickle into the Kotel. 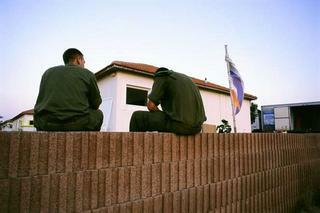 Some Heroes of Gush Katif. 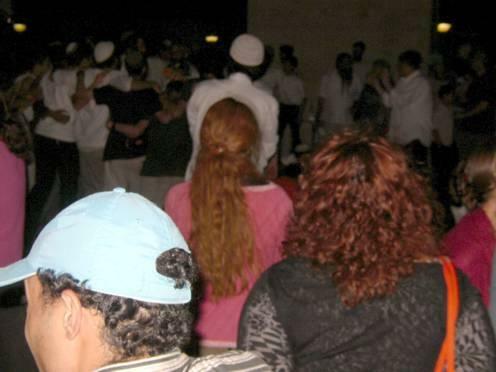 Giving Support: Crying, Dancing and Singing with the Heroes of Gush Katif. In the beginning there was yelling. But that isn’t the way and the night slowly turned from recriminations to reconciliations. Each side talked through the night. Each side sought common ground, common goals, common understandings, common beliefs. The potentials for partnerships was explored. It perhaps wasn’t everything, but it was a step in the right direction. It will take work, I think it can work. 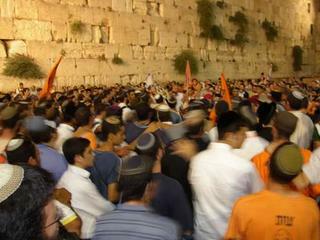 How many Leftist and Hilonim were there to greet the deportees at the hotels and at the Kotel? 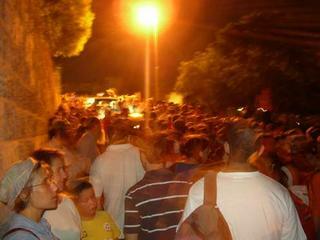 How many brought food and supplies? None would be a safe answer. Conclusions have been reached by the Jewish community. The Left, the Hilonim have made themselves irrelevant to the future of the Jewish People. They have disengaged. They’ve chosen to align themselves with other the footnotes of history. Conclusions were reached last night by the Jewish People. No matter how many times they to try beat us down, they won’t succeed, for our future is not their future. 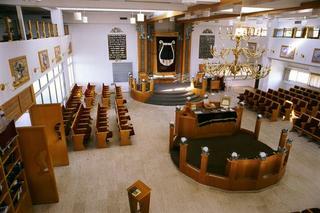 Ours is community, family, Torah. 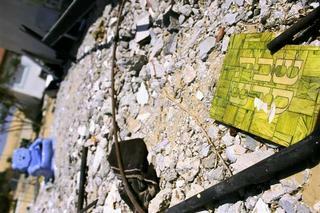 Theirs is destruction and lies. A Jewish government will arise in the Land of Israel. Last night proved that it can’t be otherwise. 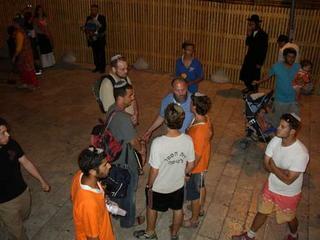 I spent last night at the Kotel greeting refugees from Gaza. I didn’t stop crying, but I also didn’t stop singing and dancing. In front of me were the heroes of Israel. Who can stand on the holy ground where they walk? We spent the night in tears, in song, in talk, in dance, in silence. 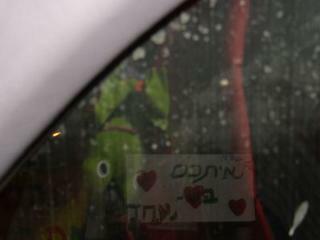 Religious Jewish communities from all over Israel came to greet and support our heroes. We all came to the same conclusion. The Left, the Hilonimm, can kick us out, can beat us, can lie, can steal, can murder, but they can’t win. 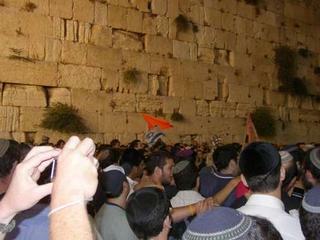 Yesterday at the Kotel proved that. 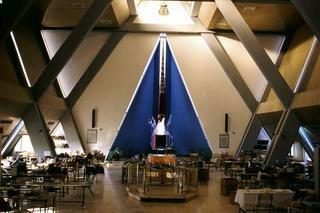 Klal Yisrael is eternal, and we passed this test, our Emunah is intact. I can’t stop crying - we won. Roadblock from the side we should all be on. Fellow Captured Blockade Runners - Prisoners in Zion Deportees being shipped out. Hundreds of these buses passed us. For obvious reasons I can’t say too much, but what an amazing day today was. Having learned the lessons of Monday, I drove down South today with the goal of getting into Gush Katif. Along the way I picked up some hitchhikers with similar goals. 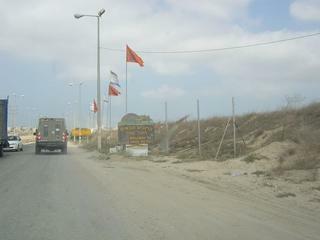 To make a very long story short, we actually made it to the entrance of Gaza, where we then got arrested and eventually released. But before getting that far ourselves, we helped numerous other people advance towards similar goals. 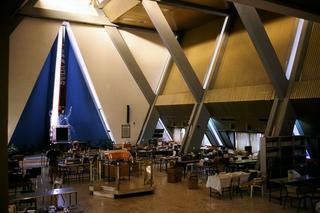 I learned some lessons about the Jewish people, from people we met along the way. There are amazing people in this country! Dedicated people. Loving people. Tenacious people. Jewish people. I feel sorry for the soldiers coerced into a mission they hate and can’t accept, and I appreciate all the “underhanded” assistance we received from them. The smiles on their faces when they saw us break through (or when they purposely ignored our rather incongruous presence smack in the middle of their heavily guarded and “impenetrable” army base) was enough to make the trip worthwhile. I even had the opportunity to have an interesting conversation with one cop who interrogated me, but overall I am still having trouble sympathizing with them. Cries of “The Calvary is Coming” whenever we called my contacts in Gush Katif and told them our progress, even though they never expected us to get anywhere near as far we did. I'm sorry I let them down. 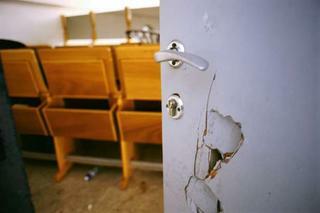 Leaving the CMZ after we got expelled was also an experience. 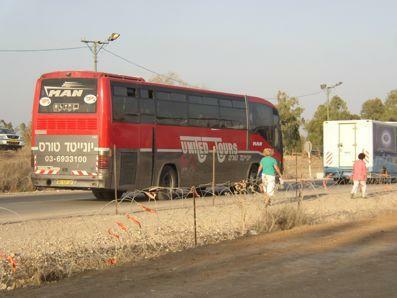 Residents from every town, village, and Kibbutz along the way were out on the road. Everyone was yelling and holding up signs of support for the deportees. 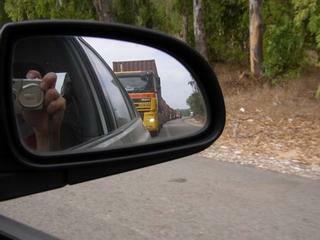 Many other people we met were bringing supplies to the deportees to help ease their stark physical circumstances. Sharon may have destroyed Gush Katif, but he hasn’t destroyed the Jewish People. 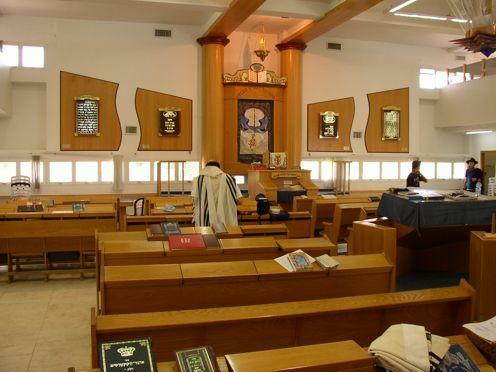 Doron, Tefillah, Milchamah - Did we forget something? What was our strategic mistake? One has to ask that once we decided not to utilize violence, despite being violently ripped from our homes, what else could we have done? Perhaps the answer is that there is nothing else we could have done, or perhaps the answer is that we need to learn for the future what else we can do. The Israelis have endeavoring mightily to achieve their assimilation attempts; they are now a nation like every other, as they too kick out Jews. And we Jews have learned the lesson that we must now treat them as such. The Left is smugly satisfied every time they now hear a religious Jew say “Dina d’Malchuta Dina” (the law of the government is the law). Yet they don’t understand what it really means. They think we are saying that we accept your rule, your “democracy”, even your abuse. What they don’t understand that it means that we will now treat them like every goiyeshe government we lived under for the past 2000 years. Yes, we will follow your rules, as long as they don’t contradict our laws. But we will use every trick we learned over the past 2000 years to survive and flourish under your hostile regime. When Yaacov was preparing to meet with Eisav he prepared himself in 3 ways – Doron, Tefilla, and Milchama (Presents, Prayer, and War). The truth is that we all forgot to do the first. The other two we did spectacularly. While Sharon was out bribing Knesset members with Ministerial seats, we just threatened. While the EU was shelling out money to the Peres Peace Center for Subversion and the Geneva Accord Idiots, we just complained. We forgot all our techniques of 2000 years. While the forces of Left were out openly bribing and buying whomever they could, we promised nothing, we offered nothing. 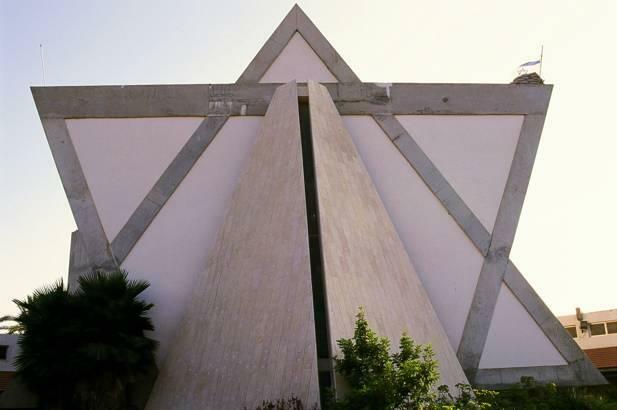 Why wasn’t an alternative to the Peres Peace Center opened with similarly juicy positions and salaries offered to influential Israeli Industrial leaders? Why wasn’t an Pro-Israel Accord organization formed with similarly hefty salaries and trips for undecided members of political influence? Why weren’t undecided Ministers openly told that if Sharon fires them we will provide them with cushy parachutes, so they need not worry about the day after? Why weren’t Likud Knesset members openly conveyed the message that they will be guaranteed safe slots in the next election if they properly vote the Likud platform? All they had were Sharon’s threats and our threats, and no fall-back positions. In the future, until there is a Jewish government in the State of Israel the rule must be, “Doron, Tefillah, and Milchama”. Ask yourself this, how many Jewish communities throughout our long history avoided destruction simply by paying off the right minister? Today is a black day for the People of Israel. 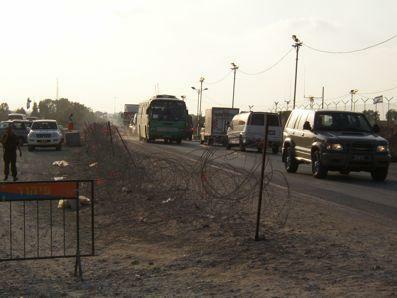 Insider reports indicated that I wouldn't be able to get much further into Gaza than I did yesterday as they seriously upped the restrictions and patrols. 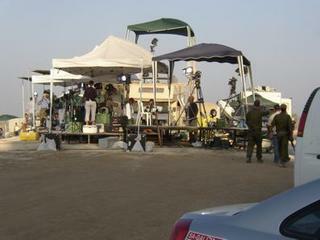 For the moment I am at work watching on TV the black uniformed soldiers push there way into Gush Katif. I have other plans for later. I couldn't help but notice, before the TV panned away from the scene, a policeman seriously choking a teenager in front of him. Non-violent indeed. Sharon's Brute Squad - as I've heard them called. I keep thinking that the message has been transmitted very clearly. Non-violent protests, half a million people in the streets holding hands, huge gatherings across the country, they did absolutely nothing. 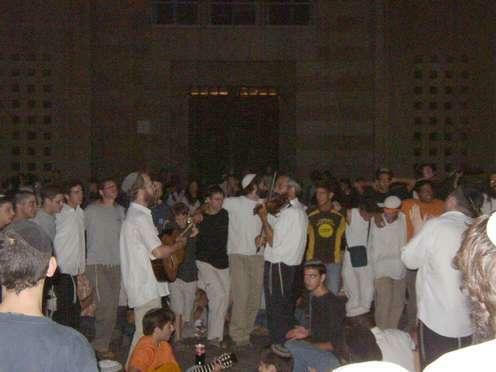 We Jews decided not to use violence, and guess what, we are being thrown out of our homes. The Arabs use violence, and guess what, the Jews are being thrown out of our homes. What lessons and conclusions am I supposed to learn from this experience? Did we avert a civil war like Begin did when Ben-Gurion wanted to start one? Yes. But to what end? The background of Chanukah is essentially not much different then ours today. In Hebrew, the official IDF acronym for the "illegal infiltrators" into Gush Katif is "SHa'Ba'CHim". 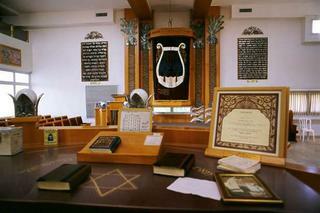 The real name for them is "Meshubachim" - The "Praiseworthy". We had to do it. What would we tell our children? That we stayed home while our fellow Jews were violently ripped and forced from their homes? And we knew the risk was more than just possibly sitting in jail. Yesterday, without instigation (for he was asleep in a tent when it started) A. was brutally beaten by a group of policemen under the watchful eye of their officer. I won’t go into the graphic details, but let’s say that one of the policemen, unsure of his own masculinity, made sure to check A.’s during his hands-on brutality. But A. courageously refused to hit back to avoid being framed for hitting an “Officer of the Law”. So I won’t go into details how we did it, but we managed to go through nearly all the roadblocks on the way to Gush Katif. Where we made a mistake in one, we corrected it in the next. In the end we didn’t manage to get in, as we reached our self-imposed deadline for attempts, but we learned enough to help others get in, in our stead. 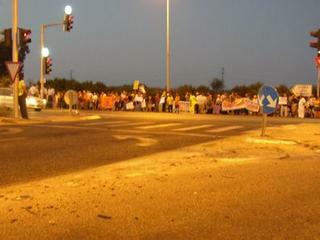 We also met some amazing youngsters along the way, sneaking in by foot from Netivot and other locations. Future leaders of Clal Yisrael. Meanwhile, another accidental maneuver taught us (and now others) how to slow down the procession of army vehicles to and from their disdainful task. It won’t stop this immoral act, but at least it will slow it down and perhaps give some of the decent, if confused, soldiers we met along the way some time to think about what they are being ordered to do. Wednesday plans to be interesting. What will be the day after? So many Secularist and Leftist seem to think that things will return to normal. 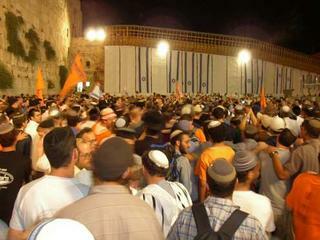 The Settlers and Religious Jews won’t (in general) raise their fists. The Rule of Law has been suborned for their Leftist goals, and those dirty Settlers (stealing money from development towns) have been taught a lesson. How often did the Left demand that the religious join the IDF. So we did. And out of the blue we became leading officers and decorated soldiers. Suddenly we stole the army from its real owners. They same was said when Shas made political inroads. So while the Left sits back in their Sheinkin cafes, ignoring the cries of thousands of Jews being violently ripped from their homes (except as a news item to smirk at), they are about to lose their country too, and don’t even realize it. We Jews made a mistake. We admit it. We see it. 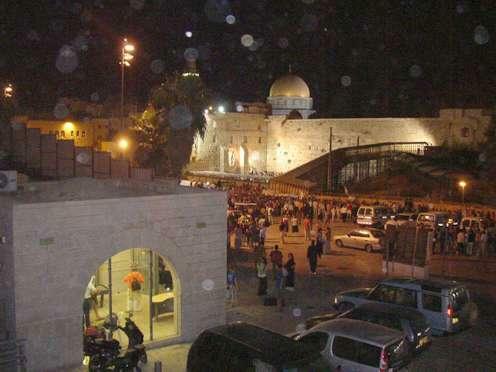 While the media reports all the time, “Where and how did the Settlers fail”, we simply don’t see it that way. You see, we haven’t failed. They have. We’ve built wonderful communities, wonderful schools, wonderful families, wonderful jobs, wonderful lives. Jewish lives. We’ve done it with hard work, with bravery, with courage, with stamina, and with belief. While our children are in the streets learning leadership, civic responsibility, morality, and what Jewish society is about - theirs are stabbing each other to death in discos. So while the Left still fails in its great attempts to assimilate, to be a nation like all others, we, the Jews, have achieved our ideals. We've succeeded, and that is why the Left has chosen to try to rip us down. The Chareidim chose to disengage from Zionism. Not to be partners with the Secularist. And yes, they were right. There is no profitable partnership to be made here. But the Chareidim made a mistake ignoring the need for the construction of a Jewish State (not a State of Jews). Both sides will soon realize that the real partnership has and should have been only with the Torah observant. A Jewish State must be built, but it must be built by those looking for a Jewish State. Yes, we will now view the State of Israel just like we view America, like the USSR, like a third world banana republic, like any other goyishe country we Jews have lived in, because that is what the leadership and founders chose it to be. But, Jewish leadership has been born, it has finally been woken up in Gush Katif, in Judea, and in Masayahu prison. Today, Rabbi Bin-Nun compared secular society to a mule. Very strong, unthinking, obedient, and it has no future. There will be a "Day After". 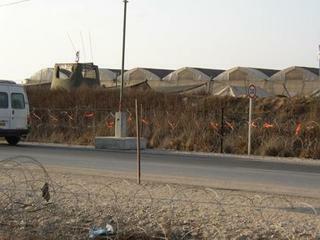 My friend 'Jameel' is under siege in Chomesh (Northern Samaria). He is fighting the deportations by being there. You can read his posts here. I just spoke with another friend (Z.) 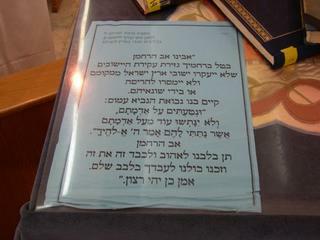 in Gush Katif. What a shame the government is lying to the nation. She tells me what is really in store. 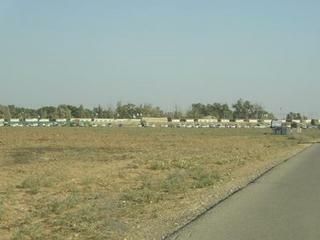 There aren't enough tiny trailers available for everyone they are expelling from their homes. The internment hotels will only keep them for 2 weeks. After that they are on their own. No jobs. No homes. Their lives destroyed for nothing. Even today there were attempted terrorist attacks. Why is this nation deluding itself that this is a solution? The answer: In another blog. Democracy is such an easy word to abuse. Almost as easy as Democracy is to abuse. 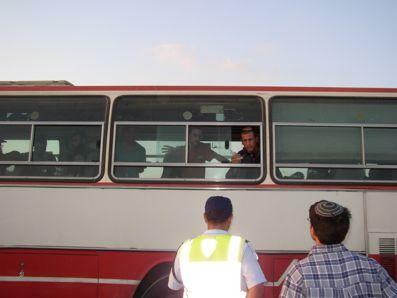 Thousands of Jews are about to be expelled from their homes – because they are Jews. Democracy has made it legal. Apparently Democracy has made it moral. Certainly Democracy has made it possible. There have been other well known times in recent history when Democracy has been similarly abused – I need not name those various times. They are so well known. But here we have a sector, happily looking forward to hurting another sector of their own society, not the enemy, via the tools of democracy. “But the Knesset passed it,” is commonly heard. Democracy has decided. Yet unlike the US Congress, Senate, or Presidency, Israel didn’t and can't vote for individuals to vote their conscience. Israel voted for a party with a Platform. Knesset legislatures aren’t voted in for their personal opinions. They are voted in to support and promote the party's platform. It is the Central Committee of the Party that decides party policy, and it is members of the party that select the Central Committee members. That is the format of Israeli parliamentary politics. And when a parliamentarian votes directly against his parties policies, he is voting against the will of the people that voted his party (not him) in. Democracy is broken in Israel. Throw the word “peace” at an Israeli and he goes all glassy-eyes. You can take the Jew out of the Shtetl, but apparently you can’t take the Israeli out.